The sun of Austertitz rose over this battlefield in modern Czechoslovakia on 2nd December 1805 to show, through the morning mist, 80.000 troops of an Austrian-Russian Alliance confronting 70,000 under the great Emperor Napoleon. By the end of the day the Allies were in headlong retreat, and Napoleon had won what is always regarded as his greatest victory. He won it with superior training of his troops, with superior manoeuvrability, with superior coordination of infantry, cavalry and artillery, and above all with the superior leadership of his Marshals of France, each commanding one of the six Corps of his army. The side that won took the offensive and carried the fight to the enemy. 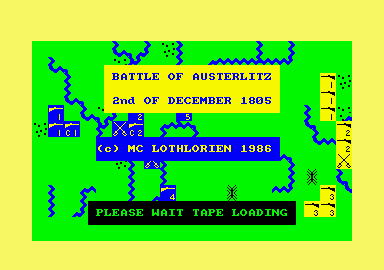 The Lothlorien game which bears the same name as the battle offers none of these features, at least in the Spectrum version which I tried. No artillery ts shown, and cavalry fight in exactly the same manner as infantry. The combat mechanism (given in full in the booklet) gives the greatest advantage to troops holding defensive positions, and the only way to win with the French is to place them behind river lines. There is a very promising system of devolved command, whereby the player as Napoleon gives outline order; to his Corps commanders, who use their own initiative and personalities in carrying them out. Bui it simply doesn't work. Marshals of France attack superior numbers with fractions of their own forces, march in the wrong direction, and generally behave in a manner which would get them all reduced to corporal, if that, in about five minutes. The computer-controlled enemy, on the other hand, shows a persistence and desire to fight well above that of the real Allies. 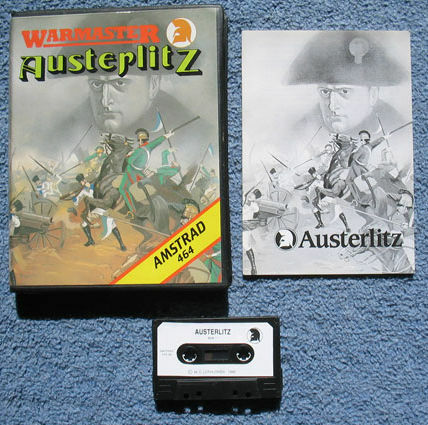 Any resemblance between the Austerlitz and the hatle of the same name, or any other Napoleonic battle, is a co-incidence. Il doesn't even feel like a wargame.